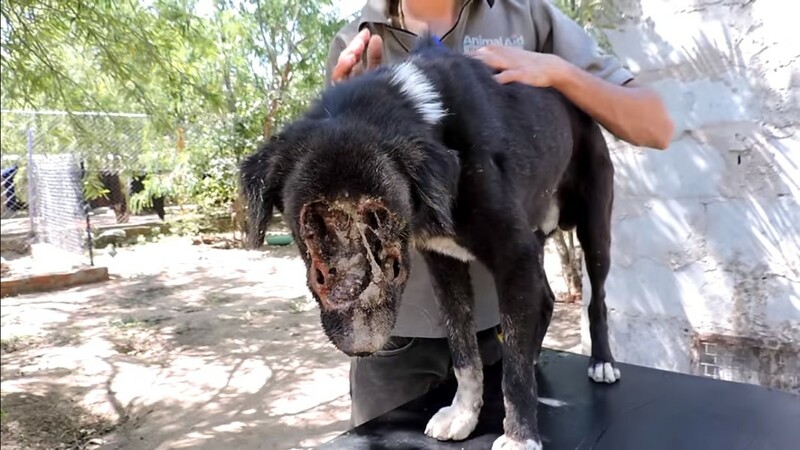 This Poor Dog’s Face Was Eaten Away By Maggots… But Just Look At Him Now! Kalu the dog is loving, excitable and full of energy. But this wasn’t always the case. In fact, the complete was true when Animal Aid India first came across him. They mounted a dog rescue mission when a report was made which tipped them off about a truly horrifying thing… The abandoned Kalu was left in an open grave. Starved and dying, he lay there. With maggots eating his little face. What to do with Kalu? Well, opinion was split. Many of the rescuers – who love dogs – were advocating euthanasia. He was clearly in incredible pain and discomfort and recovery was far from guaranteed. A vote was cast. The ‘recovery’ option won by a fine margin. So they went about sedating Kalu, removing the maggots and cleaning out the wound. Which turned out to be even worse than they expected. His skull was visible and his eyes appeared to be missing… It turned out he lost just one, but it was a distressing project.